There are many ways to make a gift to Bates. Find the option that works best for you. Bates accepts payments by Visa, MasterCard, American Express, and Discover. To make a credit card gift, you may visit bates.edu/give or call toll-free 1-888-522-8371. Many companies offer matching gift programs to encourage employees to support their colleges and universities. Most companies match dollar for dollar, but some will double or triple an employee’s gift. Bates’ recurring giving program allows you to divide your Bates Fund gift into manageable increments through convenient automatic deductions from your credit card or checking account. What’s more, you can continue to direct your Bates Fund gift to the Bates programs that mean the most to you! Make your recurring gift at bates.edu/give and check “I would like to make this a recurring gift,” or call us at 1-888-522-8371. Pledges allow you to make a commitment to be paid over a period of time (usually not more than three years) based on an agreed-upon payment schedule. The college sends pledge reminders periodically. 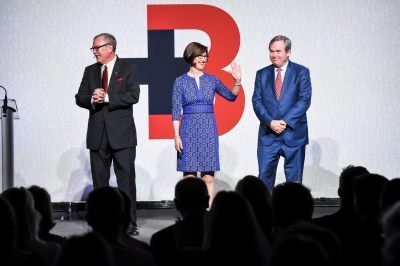 If you’d like more information on making a pledge to The Bates Fund or other priorities or initiatives, please call 1-888-522-8371. Gifts of long-term appreciated securities and mutual fund shares may be deducted on your tax statement at fair market value on the date of the transfer to the college. To learn more, contact us at 207-786-6248 or gifts@bates.edu. We also have more information about gifting securities, mutual funds, or stocks to Bates. A donor advised fund (DAF) is a charitable investment account that donors can use to support their giving. DAF donors can give cash, stocks, or publicly-traded assets and get an immediate tax deduction. DAF assets are invested for growth by the sponsoring organization (for example, Fidelity Charitable or Schwab Charitable) potentially making even more money available for charities. Donors can then recommend grants at any time from the DAF to any qualified 501(c)3 public charity, such as Bates. If you have a DAF, you can easily recommend a grant using the DAF Direct form on this page. Gifts to establish permanent, endowed funds that support student financial aid, academic programs, faculty positions, and information technology, and gifts for capital purposes such as construction, renovation, and new curricular and extracurricular programming are crucial to the college’s immediate success and long-term growth. 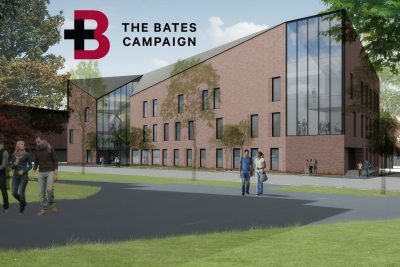 These opportunities to support Bates represent meaningful investments in the Bates experience and in the financial well-being of the college — making a difference in the lives of Bates students today and for generations to come. For more information about making a leadership gift, please contact Eric Foushee at 207-755-5985. Charitable Gift Annuities, Pooled Funds, and Charitable Trusts allow donors to retain an income interest in their gifts while supporting the college at a level greater than might otherwise be possible. Benefits usually include increased annual income, income- and estate-tax deductions, and avoidance of capital gain. More information is available on our Gift Planning website. For a personalized scenario, please contact Susan Dunning at 207-786-6246 or Jennifer Foley at 207-786-6242. Because Bates lives on and will educate future generations of students for leadership and service, a wonderful way for every alum to be part of the college’s ongoing mission is to include Bates in your Will or retirement plan. For more information, please contact Susan Dunning at 207-786-6246 or Jennifer Foley at 207-786-6242. Click here for sample language that can be used in your Will. Careful and creative gift and estate planning can maximize the impact of your philanthropy through the development of an individualized approach that complements your financial, tax, and estate situation. You can make a lasting impact on Bates — supporting our students and programs far into the future — while also meeting your family and financial goals. For more information about planning your gift, please contact Susan Dunning at 207-786-6246 or Jennifer Foley at 207-786-6242. Bates is recognized as a non-profit institution (PDF) under the terms of section 101(6) of the Internal Revenue Code of 1939, which corresponds to section 501(c)(3) of the 1954 Code. Our tax id number is: 01-0211781. Some of the above documents are in Adobe PDF format and require Adobe® Reader® to view and to print them. If you do not have Adobe Reader, you may click here to download and install it on your computer. Did you know that Amazon will make a donation to Bates every time you make a purchase? If you buy products marked “Eligible for AmazonSmile donation” through smile.amazon.com, Amazon will donate .5% of your purchase price to any 501(c)(3) public charitable organization you choose — including Bates! It doesn’t cost you anything extra, and it’s an easy way to support the college in addition to making your annual Bates Fund or Parents Fund gift. Learn more about how AmazonSmile works.